So, what does Infabode do? Infabode reduces the amount of time people spend trying to access key information from the Real Estate industry. It is a free online platform that enables people to customise their experience by choosing the sectors and regions that they would like to see content from. We work with businesses to include their research, news and market analysis on one platform; the likes of Savills, JLL, Blackstone Group, Colliers, Cushman & Wakefield and over 450 other content providers from around the world all contribute interesting content. What’s behind the business idea? When I was at the University of Portsmouth studying Business Enterprise Development, I found myself trawling through pages of search results on Google whilst trying to write my dissertation. I realised that Google was fantastic for getting facts but it was difficult to get an overview of a market or an industry. I thought that there should be an online knowledge portal for every industry, where the best research, data, news and insights were curated together and made available on one platform, through one login. And so Infabode was born and we eventually decided to focus purely on the real estate sector- although we are starting to seeing similar platforms in other industries now too. Was it hard becoming a business owner? Becoming a business owner is the easy part…. it only takes a few minutes to register a company. Running and scaling a business is the tricky bit. When people ask me what it’s like to have your own company, and I think this is true regardless of the size of the business you run, the highs are a lot higher and the lows are a lot lower. The key is to try and not get too carried away with your success and not get too down when things go against you… that’s easier said than done though because you hopefully have passion for your business and with passion comes emotion but the best business leaders are able to look at things with a long term vision. How did you recruit your employees? Initially it was people I knew and could trust to help out, these were part time helpers with the skills I needed to get a prototype together. As the business moved towards launch and we needed full time hires, I got the first 3 or 4 people through LinkedIn- I would add people with the necessary skills a few weeks prior to announcing the jobs. As we’ve grown and have required more precise skill sets, we have found ourselves using recruitment companies. No business wants to pay a percentage to a recruiter and we certainly try to hire people directly but it’s cheaper to pay a recruiter than get the wrong hire directly… so we look for the best candidate available. If the company continues to grow and becomes the hundred million/billion business we think it could potentially become then I expect recruitment will come back in house, with a HR and recruitment department. Hiring is the single most important thing we do. In a company like ours you really are only as good as your team. Thankfully our team is getting better and better and there’s a real family feel to Infabode- I couldn’t be prouder of what we’re starting to build together. Was there a breakthrough moment? When you’re at a startup you can often feel like you’re treading water and it’s only when you look back over a period of time that you realise how much you’ve actually achieved. We are very proud of our progress, especially in the last year. We now have over 450 companies providing content on Infabode, which has been incredible growth. To give some context to this, it took two years to persuade only ten companies to join Infabode prior to our launch in 2016. This change in speed just represents the shifting attitudes to technology and the sharing of data in the property industry. Having never had a proper marketing budget, through purely organic growth, we now have 17,000 individual members. These are real estate professionals, as well as students and academics from around the world. We’re a UK based company but have seen more active users from the US than the UK over the first few months of 2018. Infabode is certainly starting to feel like a global business now and our current funding round is very much about capitalising on that growth. There are things I would definitely have done differently in hindsight and there’s things I wish I’d known earlier in my business career but I’ve only been able to make decisions on what I’ve known at that time and hopefully more of those have been right than wrong. I’m very lucky that my father has huge business knowledge and I have a real who’s who list of investors, so I’ve been lucky to have a great support network around me. I’ve made plenty of mistakes and got a lot of decisions wrong along the way but nothing I badly regret. How did you over come them? Those decisions you get wrong you’ve got to quickly identify them and try to put them right. There are a lot of PropTech companies out there now and they are all looking at many different problems. A lot of those companies in our space are analysing, managing and selling data. We wanted to take a very collaborative approach and build a platform from which these companies could potentially operate from, rather than competing with other Prop Tech businesses. We don’t produce any market data ourselves…. we are focussed on connecting those who do produce industry information, with those that want to access it. What is your definition of a positive customer experience? A customer that either tells lots of people about our platform because they’re so impressed or a customer that doesn’t want to tell anyone else about our platform because they’re so impressed and want to keep it a secret! You’re currently reaching out for investors, what do you plan to do when you have raised this funding? 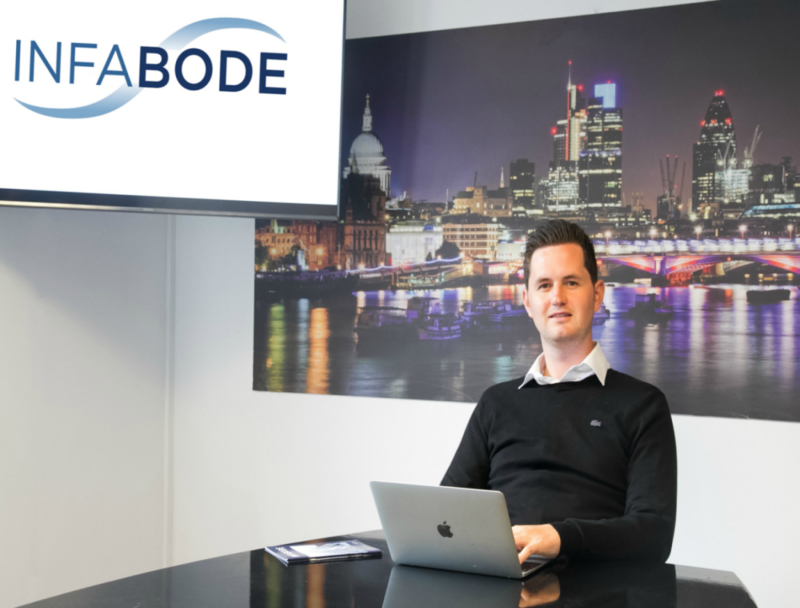 We are raising a minimum of £750,000 so that we can take Infabode to the next level, expanding awareness of Infabode across the globe and improving our technology offering. There’s a number of exciting new features that we’re hoping to launch over the coming months. If you could help a business now with a single piece of advice, what would it be? No matter how good your idea is, if you don’t have the right team around you then you won’t be successful. But a good team doesn’t need to necessarily be a team full of experienced industry professionals… I think it’s more important to have a team you’d trust to represent your business, get the right personalities in the right job roles and hire people for positions in the right order… this last one can be hard, especially when you probably need ten hires but have the budget for one. Finally, Matt what is your favourite biscuit?! I weirdly don’t really like chocolate. But my favourite biscuit is probably chocolate chip… so I’m not too sure how that works!